At beginning of the year 2018, planet Saturn is in Sagittarius sign (6th house for Cancer sign) and Jupiter is placed in 4th house. For Cancer sign, 2018 will be a prosperous year. Compared to last year, this year will bring in better financial prospects and cash flow. 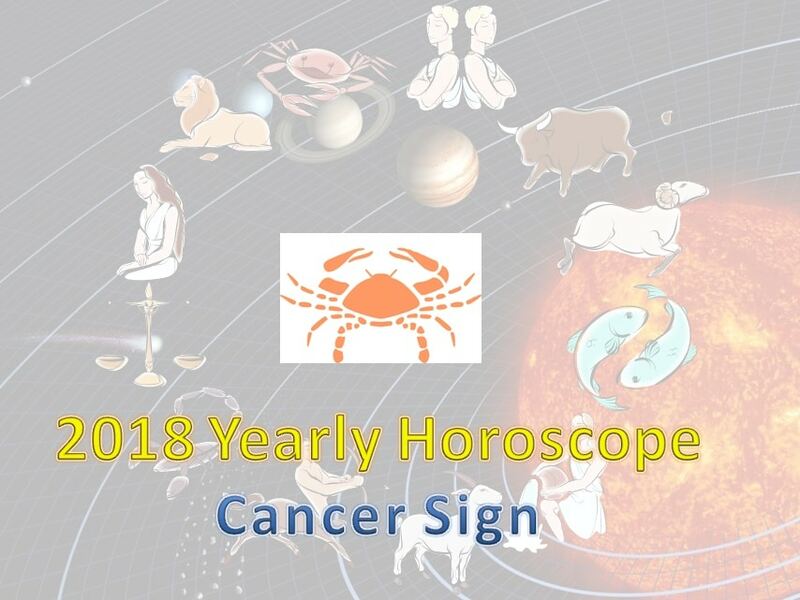 Your career, be it a professional one or business one will be successful for 2018 yearly horoscope for Cancer sign. As Lord Saturn is in your 6th House, you will have great courage and face anything head to head. Your managerial abilities will also rise, making your talents shine well. Especially those in their thirties will get to showcase their talents, intelligence and reap victories. As per the planetary positions, Lord Saturn in the 6th House will result in great achievements. Depending on your natal chart, your degree of success will vary. The main outcome of this year will be your buying a house, whether it be new or old. Some of you will shift to a better house with amenities. Some will take lease of new properties. The feelings of worthlessness and negative thoughts assailing your mind will go away. Fear and confusion will vanish, bring you good cheer and enthusiasm. People of other religion and language will be affectionate towards you. You will make friends with people of other states, who will be beneficial to you. Your work will take you to faraway places. Your journeys will increase, but your enthusiasm will remain unabated. People searching for jobs will get a good job. Those who had been employed in jobs unrelated to their passion or education, low paying jobs will get a chance to shift to better jobs. Women will earn a good name in your family. Women at work will get salary raises and promotions. Your co-workers, especially men will be supportive. Your employers will praise your work. Everything related to foreign, be it journeys trade or investment will bring profit and success. Those struggling for visa for studies or work will get them. If you have never been to overseas places, you will get to visit them now. Those travels will bring in good news. Your marital relationship will flow smoothly. Unnecessary expenditures that siphoned off your money will stop. You will be able to save money now. This is the best time for forging new partnerships for the self-employed, businessmen and traders. Your partners will infuse new money and help your business. Entrepreneurs can get the required help for their ventures and reap great success. All that is needed is hard work, the intelligence to grab the opportunities and dedication in your work. You will take up religious and charitable activities and gain a good reputation. You will indulge in restoring old temples. Those in political and social work will rise to places of power. Politicians will become famous. People suffering from court cases, police and law problems will see their problems resolve amiably. Those who had taken up debts for very high interest rates and without any way to pay back will now have the means to repay your debts. Youngsters and students will see the direction of life change. Some will get to meet new lovers and see success. Some might even meet their partner for life. Someone you meet this year will end up as your close friend for the rest of your life. Your mother’s love and support will come to you now. Any problems in your maternal properties will solve. Obstacles in continuing or pursuing higher studies will go away. Take care of your aging mother. Try to fulfil her needs. Those who stay away from their mothers should try to visit at least one a month and seek her blessings. If you were suffering from ill-health, it will improve. Those health-issues which could not be treated by medicines will vanish. You might have had worries regarding your kids. You could not find any good partner for your children. All these issues will resolve and you will be able to perform your duties towards your children well. 2018 is a very good year for cancerians. Your name and prestige will rise. Your monetary problems will go away and your savings will rise. You will have the blessings of the God and your planetary positions are good. Hence this year will be prosperous and bring you happiness and peace. Your actions will be successful and your position will rise in society. This New Year will bring you good news in all fronts and lay a solid foundation for your future.